New Yorkers, as you probably already know, are passionate about pizza. So when I get a pitch informing me that a startup is employing robots to prepare cheese-covered pies, I just have to snicker. Really, Silicon Valley, pizza is the latest problem you need to solve with robots? But clearly, Julia Collins, co-CEO of Zume Pizza, has put some thought into this beyond my closed-minded New York worldview. On Thursday, Zume announced what it says, in a press release, is the world's first "food delivery vehicle that cooks en route." The truck utilizes 56 ovens to deliver food that doesn't spend too much time in a box. "New York is full of storied mom-and-pop restaurants serving incredibly delicious pizza, with recipes handed down through generations, and this is the pizza that inspires us," she wrote to Entrepreneur via email. "Sadly, the majority of us can’t go and sit down to enjoy a fresh-baked pie every time we want pizza. Instead, we’ve become accustomed to ordering delivery pizza that arrives greasy, lukewarm and packed with preservatives -- but it doesn’t have to be that way." Fair point. I've certainly eaten my share of Domino's and its ilk, and I barely consider what those eateries serve to be pizza. Those places are, unfortunately, the main options for most people outside large cities. Pizza is a $40 billion annual industry in the U.S., according to IBISWorld. It's mostly dominated by Domino's, Little Caesars, Papa John's and Pizza Hut. But Collins, along with her co-founder and co-CEO, Alex Garden, who is an inventor and the former president of Zynga and general manager of Xbox Live, offers a compelling argument for Zume's model vs. these brands. "First, the quality of the food that is being delivered is not very good because it’s pumped with added sugar, synthetic nitrites and preservatives," says Collins, a long-time restaurateur. "Second, delivery pizza is slow -- it takes 45 minutes on average to get to your door. Third, the packaging is not eco-friendly because cardboard boxes come from trees. Fourth, it’s not very profitable." 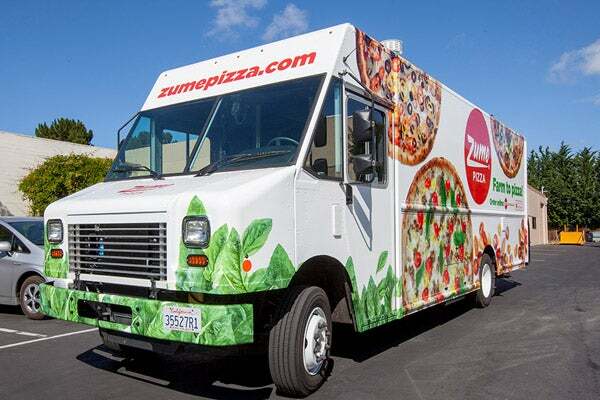 According to the company, the pizza is parbaked -- the dough is cooked for 90 seconds -- at the Zume Pizza headquarters before it's transferred to the food delivery vehicle. Prior to its arrival at a customer's door, the pizza is baked for three minutes then cooled for 30 seconds. The truck currently delivers to customers in Mountain View, Calif. It's important to note that I haven't tried the pizza, so I can't attest to its freshness or flavor. "Our proprietary pizza-making robots, also referred to as ‘P-Bos,’ automate unsafe, repetitive tasks associated with food preparation (ask any pizza chef about the number of burns on his or her arms!) so that we can invest in more high-quality, locally sourced ingredients," Collins says. And the technology doesn't stop with pizza. "At the present time, we are focused on optimizing our operation to create the very best pizza delivery experience in the world," Collins says. 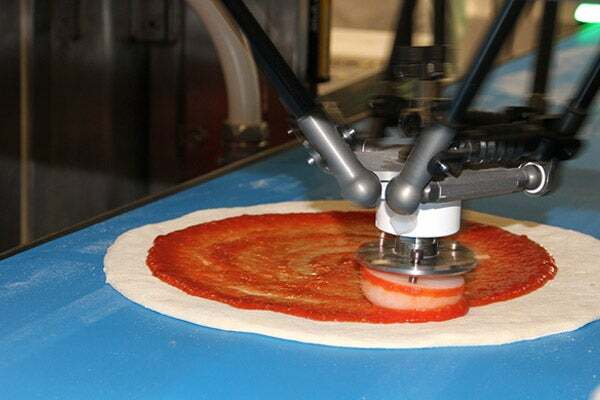 "Once we have perfected our pizza operation, we will have the ability to expand beyond pizza. In fact, our patents cover cooking all food en route." It's a future I'll just have to taste to believe.